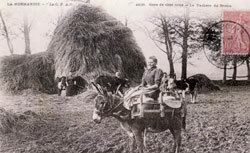 For centuries now, the Cotentin donkey has been present in all small farm's in Lower-Normandie. At the beginning of the century, the only department of the Manche counted approximately 9 000 donkeys, used mainly like pack donkeys to transport the cows milk. Before 1940, more than 300 donkeys were sold each year in Lessay fair in the Manche. They have gradually disappeared from the countryside as the result of the modernization of agricultural techniques. But, nowadays we can see they have quickly increased its numbers. In the department of the Manche, the donkeys are approximately 2 500(all breeds). The Cotentin donkey was officially recognized by the Ministry of Agriculture in August 1997. 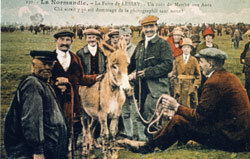 Since this date, the National Stud farms manage the herd book of the Cotentin donkey. Nowadays, we count approximately 1200 Cotentin donkeys among which approx 800 are recognized on an initial title and approximately 400 with origin known. Since August 2001, the herd book on initial title of the Cotentin donkeys is closed. A certain number of Cotentin donkeys are approved by public covered, the National Stud farms. Each stud owner completes the declarations of the covering and birth on the notebooks given by the National Stud farm. Before the foal reaches sixmonths, it is necessary for the breeder to have the foal identified by an approved vetenary ie. microchip and certificate.